A few years ago, my friend John told me that he completed the Rim to Rim to Rim Crossing at the Grand Canyon, but I didn’t truly understand what he was talking about. 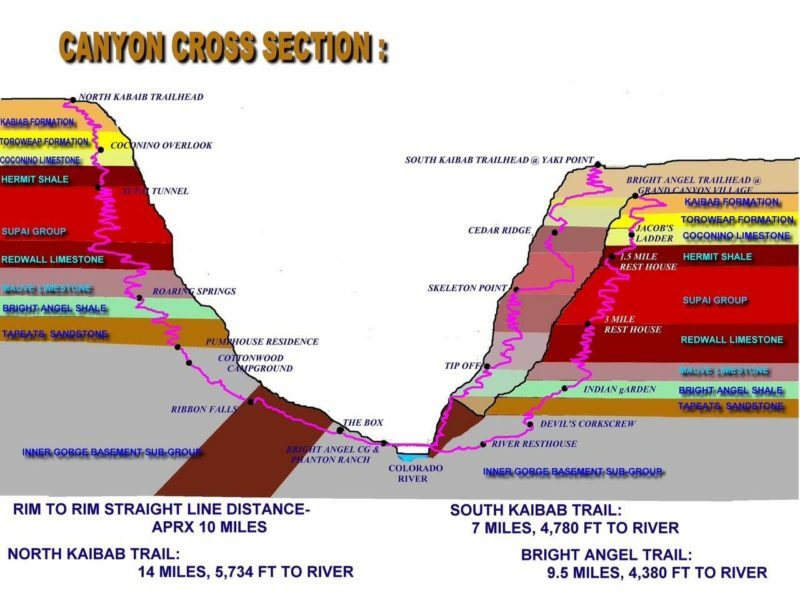 I had been to the Grand Canyon but didn’t really know of any races or trail runs or any kind of adventure run held at the Grand Canyon. I later found out it’s not actually a sanctioned race but it’s a trail run that people do on their own or with a group. The concept of Rim to Rim is to start on either the North side or the South side of the Grand Canyon and run to the other side. As the bird flies it is approximately ten miles from Rim to Rim, but after negotiating the steep trails and running across the floor of the Grand Canyon, it totals twenty-one to twenty-four miles one-way. In the very beginning, when I first learned about the Grand Canyon crossing, I wasn’t super interested in attempting it. But as I continued to do triathlons and different forms of marathons, I decided that doing something a little bit outside the box would be fun. I heard from different sources and friends who had done the Rim to Rim crossing that it was a great experience and that I should definitely do it. At some point over the last two years I made a mental note that I wanted to add this to my bucket list of races. Last year my friend Dan urged me and another friend Woody to try something different. Something epic. He talked about climbing a mountain or going on a seven-day rafting trip—explore something that we have never done before. But we couldn’t settle on something. By November of 2016 I was thinking of what I could do in the 2017 race year, and the Rim to Rim idea that had stayed in the back of my mind resurfaced. So I decided that 2017 would be the year that I would attempt the double crossing of the Grand Canyon. I made the first phone call to Woody because he is a pretty easy yes on crazy adventures that we have done in the past. Woody and I have run in multiple races, including ultras, and taken long bike rides together. I didn’t think it would take a lot to talk him into it. I gave him the lowdown on what I was doing and when I was projecting to go. I described what the whole thing would look like. Within three minutes he was committed. I knew Woody would come through for me. The next phone call was to Dan. I knew he would be a bit of a harder sell. When I threw it down, his first response was no. I immediately pushed back and reminded him that he expressed a strong desire to do something epic. I said, “How can you argue against running through the Grand Canyon?” So then he tried to negotiate down the distance–instead of doing the double-crossing (going from one side to the other and back) that we just go one way. But at the time of the year I had planned on going, the North side was closed so we did not have a choice: if we got to the other side we would have to come back. Eventually Dan came through as well and decided he would do it. This made our group of three, which I felt would be adequate to go on our little adventure run at the Grand Canyon. I made reservations at a hotel that was within five minutes of the Grand Canyon’s South Rim. I planned on flying in on Thursday night; conveniently, I have a brother who lives in Phoenix. I could spend the night with him, then get up the next morning and drive to the Grand Canyon. That way we could check out the Grand Canyon on Friday, get set up in the hotel, spend Friday night, and do our race on Saturday. Not a race but our unsanctioned run. On Sunday after we finished, we could go back to Phoenix, spend the night with my brother, then come home on Monday. I later realized that this was pushing the schedule a little bit tight but we will talk more about that later. I have never done a Rim to Rim before, so I tried to figure out what I should do to prepare for this adventure. I have done a 50k and fifty-miler in the past so I felt it would be a similar concept as far as run as much as you can, practice off road, and always work on my nutrition. Fortunately, where I live there is a trail system that allows me to run off road as much as I want. It is short but it is adequate for working on my footing, running off road, and as a bonus my Vizsla, Miles, loves it as well. I also trained with Rogue Running because I felt that keeping up my quality runs with them would be beneficial. I continued to work on my form as well as my speed. As for the long runs, I did most of them solo in the beginning. I ran around my neighborhood and tried to add a little bit of the trail system in it as well. Three months out, I felt I needed to add in more hill work. Austin can be hilly, but it does not have the kind of hills that we really need to train for all-day climbing. I started doing work on the stair-climbing machine two to three times per week, walking at a fast pace on the stair climber to simulate hiking up the Grand Canyon. I felt it was a good concept. About six weeks out, the gang and I started doing some longer runs together. We utilized Lake Georgetown and different venues around Austin to work on our trail training. This time we also included carrying our packs, carrying our nutrition, and working with trekking poles etc. We wanted to spend as much time as possible on our feet practicing with our nutrition. 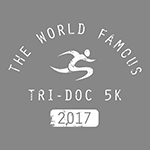 We also wanted to work on alternating between running and walking, since we’d be doing a large amount of that throughout our run. Overall the vast majority of training was uneventful. We just put in a lot of miles and practiced carrying our gear a lot. We tried to anticipate how long it would take and the numbers were all over the map, but Woody and I eventually settled on right around the eighteen-hour mark. It was a realistic number for us to be able to finish the Rim to Rim to Rim Crossing. About fourteen days out from the trip we encountered a couple of hiccups. 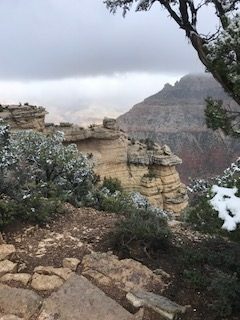 The first thing that we learned is that because of the snow, runoff at the North Rim of the canyon had caused a lot of rocks to fall on some ledges, putting rocky patches along the trail. 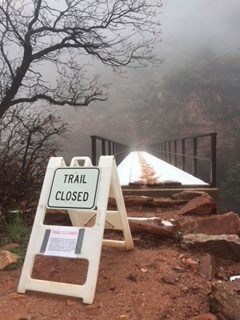 It was not completely impeding the passage, but the park staff felt that they needed to close a section of the North Rim while they worked to clear the trail. This was a one-mile section of the trail about two miles from the top of the North Rim, which they closed every day, seven days a week, from 8:00 a.m. to 4:30 p.m.
Our gang was absolutely devastated because we had been training for this for months and then all of a sudden we were stuck trying to figure out how to get from one side to the other and back. Our race looked like it was not going to go as planned. We started to look at different options. 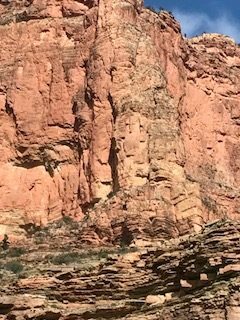 We could either run to where they would cut us off and get a partial Rim to Rim to Rim or run down about 15.1 miles, then turn around and come back and call it a 50k in the Grand Canyon. We would still get to experience a good portion of it but just do it at a shorter pass. We agreed to wait and make a decision when it got closer. The next setback was my friend Woody–the boy scout of the crew, the guy who always thinks of everything (the planning, first aid, and all of our backup), the pillar of our three-guy group–suddenly had to take a last-minute business trip to Spain. We all understood that Woody needed to do what he had to do for his work, but at the same time, we were disappointed that he would not be going with us. I have always said he is our rock. I have been with him during races and no matter how bad I have been hurting, he has provided stability, strength, and motivation to continuing to move forward. Eight days out from our run–my birthday weekend–I woke up on Friday planning on taking the weekend kind of easy. 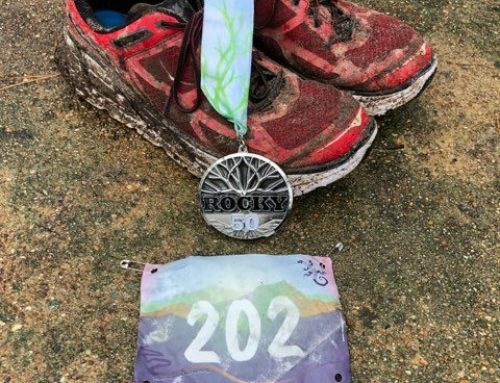 Get in a few running sessions, take a practice trail run on Sunday with the Rogue Trail Series, but as it turned out I woke up on Sunday morning pretty sick. I was freaking out a little bit. I had no idea what I had or where I got it. What I did know was that there was no time to get sick especially this close to race day. I changed all those birthday weekend plans to camping out on the couch and resting, trying to expedite the healing process. It was unrelenting and while I never ran a fever, I felt like I had gotten run over by a truck. Finally, by Monday I was feeling 70-80%. I went back to work, but working out seemed like a stretch even though I was within a few days of leaving for the Grand Canyon. I took naps during the day as often as I could, and just tried to rest up. Thursday night prior to leaving on Friday, I was sitting at my computer scrolling through a Facebook group where we got a lot of information for on the Grand Canyon trip. I read that some guys were doing overnight excursions. They figured they could make it through the other side, through the cut off and back prior to the trail closing. They could pull off the whole trip and still do the double crossing. I then started thinking wait a minute, we could do that. I put pen to paper and figured out a couple of different scenarios. What if we started much earlier or much later than what we had anticipated? I finally realized that if we started at 10:00 Friday night we could get through the other side, climb to the top, and make it back through the tunnel prior to the closing. It seemed to work for me. I knew this would be an easy sell to Woody, but Woody was not going anymore and the hard sell would be to Dan. I started a group text saying “hey I figured out how we could do the double crossing.” Surprisingly enough Dan didn’t freak out. I knew I still had some convincing to do to get him to go from a 50k to a double crossing; but hey it was worth a try. Then it was go time. I packed the last-minute essentials and prepared our supplies, getting the right pack, and even though I had a pretty good idea of what I’d need, I took redundant almost everything. I wanted the ability to change from heavier to lighter clothes, so I took several different outfits because I had no idea how I would feel doing this. I also didn’t know what I would do if we decided to go at night versus the daytime. I proceeded to the airport. Even though I had given Dan my flight information he decided he would take his own flight; as a result, he ended up arriving a couple hours earlier. I have no idea when I provided my flight information how he was able to book a flight earlier than me, but he did. My brother grabbed us from the airport and took us back to his house. I always enjoy seeing my brother and his family. I have a nephew who is five years old; I get to be the silly uncle and give him a hard time. We slept well and woke up the next morning ready to head out of town. My brother loaned us a car and we picked up food and various last-minute supplies for the crossing, then we headed towards the Grand Canyon. When we left Phoenix, it was in the 60s and we were wearing shorts and t-shirts since it was relatively nice. I noticed in the car that the temperature was dropping as we drove to Flagstaff. About ten miles out of Flagstaff it started dumping snow. In Flagstaff we decided to eat before driving the rest of the way to the Grand Canyon. By now it was pouring snow. We got out of the car–in shorts mind you–and in the restaurant noticed everyone around us was wearing heavy jackets. I am pretty sure they all thought we were idiots. During the drive from Phoenix I had pitched the idea that would have to make an alternate plan–instead of sleeping Friday night, we needed to start the run across the Grand Canyon. Surprisingly enough Dan agreed with me. He felt that we had made it this far, why not go the distance and attempt to make it all the way across? This changed things up a little bit because we would not able to sleep on Friday night. We needed to get to the hotel as soon as possible, check in, and possibly get some rest before we headed out that night. When we arrived, Dan wanted to see the Canyon and look off the edge. Dan had never been to the Grand Canyon so when we got there he was floored by the amazing views. If you have never been to the Grand Canyon, a photograph won’t do it justice. You are wasting your time. I would highly suggest that you go see it at some point or another. It is definitely one of God’s amazing beauties. We decided to enter the national park and find the point along the South Rim where we were going to start. The ranger at the park entrance told us to walk half a mile after we parked our car. But we walked approximately 2.5 miles and never made it to the South Rim edge–his half-mile estimation was way off. Remember, we were walking in flip flops and shorts while it was pretty cold and lightly snowing. But as we came around the South Rim trail, we saw a moose standing there, which startled Dan a little bit. It was the closest I had ever been to a moose in nature. After hiking too far we decided that if we were going to get any rest we needed to head back. Back in the hotel room we made a final gear check and loaded everything up. I figured we could go to sleep for two hours. I crawled into bed and laid there wide awake. Of all the times I couldn’t sleep. Finally, after an hour and fifteen minutes of being restless I dozed off, only to wake up a couple minutes later with the alarm. I got somewhere between forty-five minutes to one hour of sleep. Dan told me that he did not sleep at all. Be that as it may it was time to go. We hopped in the car and headed off to the canyon. At this point it started snowing again, which was not something we had anticipated on our trip. As we drove towards the Canyon the snow picked up and heavy flurries made some nice ice flakes. The temperature was in the low 30s—we had expected it might be a little bit cold, but not with so much snow. By the time we got up to the Grand Canyon’s edge where we planned to park, the snow was really coming down. Dan commented that he wished that the guys at the front gate had told us to turn around. I looked at him and said, “Get out, it is time to go!” We got our packs out and got situated, then we headed towards the rim. Unfortunately, we were running a little bit late. We got to the South Kaibab Trail, took the Facebook picture, and began the descent. This is the steeper of the two trails and it is the shortest way to the river. It is about seven miles versus Bright Angel trail which is 9.5 miles. One of the eeriest, creepiest things was when I shined my headlight over the edge—it looked like I was looking into the abyss. I could not see anything. We could only see directly in front of us or the cliff or embankment to our side. We descended for approximately two hours in the heavily-falling snow, which was not sticking but it did make the ground slippery. I could tell that they had some snow or rainfall recently because the mud on the trail was pretty slick. Dan fell once; it was pretty minor, but he reminded us that we needed to be extremely careful. Trekking poles were a must. I slipped a couple of times too, but we continued our descent. We finally made it to the river in a little over three hours. We felt really good at this point–the snow had stopped and the temperature had risen a little. Walking across the Grand Canyon in the pitch black was kind of a neat experience. We heard rushing water from the Colorado River from about a half-mile back. Unfortunately, due to the snow and the overcast weather it was extremely dark and we could still only see the path as far as our lights extended. At one point during the descent we stopped and turned our lights off. It was like sitting in the closet. We had hoped to see some of the beauty of the stars at night, but we could not see a single star this night. We made it to the river. Reaching the point where North Kaibab and South Kaibab meet felt like a good time to take a break. We ate, then headed towards the North Kaibab Trail. We made it through the Bright Angel campground and the Phantom Ranch campground. Since it was about 2:30 in the morning, we saw some tents but there were no lights and no sounds from anyone. At this point we still had not seen one hiker. After we left Phantom Ranch, the North Kaibab Trail started following Bright Angel Creek. I would think during the summer months it would be a gentle flowing creek, but at this time of the year due to snow melt it sounded like rapids the entire night. For hours we could hear the rushing water while we were running along. At this point the terrains leveled out–there were general up and downs, but we could move from a hiking pace to a slow run. We were somewhere between ten and fifty feet from the creek bottom, and it was a little easier to feel confident with running. During this time, we tried to make up some time and we were actually doing well. We felt good, enjoyed some good conversation, and continued to eat on time like we should. Somewhere between Phantom Ranch and Cottonwood campgrounds we came to a crossing in the road. It pointed to two destinations but neither one was the place we wanted to go. This time we realized that we probably should have taken a map with us. Where was Woody when we needed him? Dan thought we should go to the right. I thought we should go to the left. We took off and went about fifty yards to the right, but I insisted that we turn back around and go the other way. Dan said ok. We made it about half a mile and ran into the creek. Apparently I was wrong. We turned back around and headed to the crossing the way that Dan had suggested and it was the correct way. We came to Wall Creek 14.5 miles into the trek. Remember, this was usually a small creek. In the springtime this looks like it could be passable. There were some rocks we might hop, skip, and jump across. But because of the snow melt this was a heavy creek crossing. I turned around and looked at Dan. He looked like he had seen a ghost. He said, “It is time to turn around.” I knew that I couldn’t give him time to think or he would try to turn back. So I knew I had to act quickly. I took off my shoes and put on my flip flops that I had packed in case we had to go across any water crossings and entered the water. Holy cow, melting snow is extremely cold. I felt like I was walking through an ice bath. I hate ice baths. It was not the best thing to do when the temperature was as cold as it was outside. But I made it to the other side and looked at Dan. He took off his shoes and started crossing the river. It took Dan a few minutes to get there. We used this time to get fueled up on nutrition. At this time the trail started climbing while the temperature dropped. I was watching our clock and I knew we were struggling to get to the other side. So I stepped up the pace. We were just hiking, but my heart rate was definitely going at a running pace. Someone who looked at the numbers on our Garmins would think we were not moving that fast. I have never had my hands and feet be so cold and yet have my face be so full of sweat at the same time. This was my favorite part of the Grand Canyon. We zig-zagged across the trail that seemed to be cut out of the wall. Looking straight up, the wall was a quarter-mile high; looking over the ledge, it was anywhere from a quarter- to half-mile down. As we continued to move up the Rim we started to see traces of snow. The further we went up the more snow we got. It looked like we had walked into Christmas. This was a little late for the Grand Canyon being that it was April 1st. At that same time you never know what you are going to get when you go to the Grand Canyon. Around this time, we saw our first human–a guy who had started four hours earlier and was coming back from the North Rim. We continued across the bridge and found the point where the rangers were going to shut it down. We knew at this time we were on a deadline. We had to make it there and back across. We found all the rocks in the trail they were talking about. To cross some of them we had to slow down and crawl over. This made it a little bit challenging—I began to understand why they needed to close the trail to make it happen. I was hiking as hard as I could and while it was relatively cold, I was pouring sweat off my face. 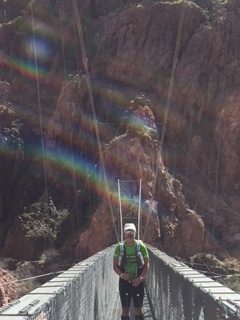 We made it through the Supai Bridge and headed towards the top. We were cutting it extremely close. I was starting to lose Dan, although I knew he was only a couple blocks back from me. We were doing switchbacks as we climbed the North Kaibab. I finally made it to the last ranger station–I was within one mile of the stop. But if we didn’t make it back in time and the rangers shut down the trail, we would be stuck at the North Rim for eight hours while they were working. The other option was to turn back now. No matter what I knew I needed to wait for Dan to catch up. After ten minutes Dan showed up, but he looked a little piqued. The hard trail climbing up and pushing the pace was starting to take its toll. I laid out our options. We could either go to the top, finish the last half mile, and hope they would let us come back through or we could wait eight hours. We talked to another guy as he was crossing back over. He said more than likely they wouldn’t let us through. With respect to the park service, Dan and I decided that while we were within eight-tenths of a mile from the top, we didn’t want to risk being stuck on the other side for eight hours. We decided to turn back around. The descent became quite a bit easier. This meant our heart rates started to decrease since we were at an easier pace, no longer pushing it so hard. My body temperature really dropped and my hands got extremely cold, to the point of pain. We made it through the section that they were going to close—with three minutes to spare, at 7:57 a.m. The rangers who were going to do the work came up from Cottonwood Trail, which was down inside the canyon, instead of where I figured they would come from, the North Rim. I was really happy we turned around. We made the right call. I had to take a break after we crossed the bridge. My hands were so cold, I couldn’t feel my first three fingers on either hand. I took my gloves off. They weren’t actual gloves for weather but they were mechanics gloves. I thought the mechanics gloves were genius because they would provide good ventilation for my hands and would not let my hands get so hot. This was a great idea for the daytime trip we had originally anticipated. They were not ideal for nighttime. My hands hurt so bad I tried to put them against my body but it was not helping a whole lot. Dan told me that he had doubled up on gloves, and he generously offered me his second pair of gloves. I put my gloves on top of them and we continued our descent. I knew the closer we got back into the Grand Canyon we would feel better. Which also meant that as the temperatures came up my hands would warm up as well. It took close to 45 minutes before my hands returned to normal. We also could tell that the hard pace of the last push down the trail had taken its toll. I had slowed down on drinking and on nutrition, and although I felt ok at the time, those few hours took an extra toll on my body. As the sun came up we really began to experience the beauty of the canyon and we were able to enjoy it. We saw the depth and beauty of the Grand Canyon. As I said before, if you have never seen it, do yourself a favor and go out and experience it at some level. You don’t necessarily have to hike down into the Canyon but experience it from the edge. As we hiked along the canyon wall, we saw the river that made all the noise, and we began to see a lot more hikers and runners too. Somewhere in the bottom of the canyon, I was walking around thinking about how beautiful God’s beauty was. I looked up on the wall to see a cross. The cross was so perfect; it looked like somebody carved it but at the same time I could tell that nobody could get to that. It was at least a quarter-mile from the top and further from the bottom. It looked like it was etched in 3-D. It was one of the coolest things that I have ever experienced in my life. I stopped and shared this moment with Dan. He agreed that it was a pretty cool and memorable sight. I took a picture of it and although it turned out well, it wasn’t the same as when I saw it. 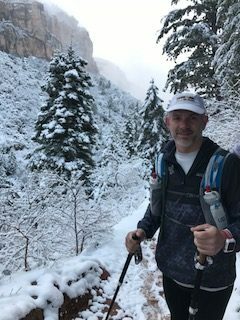 We decided we would try to go up South Kaibab because it was a shorter route, but then we talked to other runners going through there who all said they were going to Bright Angel because of the difficulty of South Kaibab. After further discussions with Dan, we decided we would turn and go to Bright Angel. This would extend our route another 2.5 miles, but it decreased the vertical elevation gain. We felt it was the right thing. We returned to Phantom Ranch about fifteen hours in. We stopped to take a 15- to 20-minute break at a little store with some park benches. Dan went inside and got us some snacks. At this point my upper back was giving me a lot of grief, I guess from carrying the pack so long, and I was starting to get really tight. The prolonged pulling on my back had taken a toll on me. The whole trip was starting to get less fun and be more like work. We refilled our water bottles, and then stumbled back around, across the bridge, and began the ascent to Bright Angel. The first two or so miles seemed more flat than anything else. I felt in my head that we were wasting time. At the same time the temperature was coming up to the warmest it had been the whole day. By now I was feeling the 15 or so hours on my feet, the lack of sleep, and just getting over being sick. As we continued up the trail, we had to take frequent breaks because I was bonking out really hard. Dan was a trooper and stayed with me. He encouraged me and helped me out. I slowly started to feel better but at the same time my body was not having any part of it. I have told people since then that essentially what happened was my body said you can do whatever you want but we are giving up. My body was just done. This was due to the lack of sleep, being fatigued, and getting over being sick. We met some people who heard that we were doing the double crossing. Apparently, they were pretty impressed. Dan and I joked that we reached a celebrity status at this point. It seemed like forever the switch backs just continued to turn as we climbed. About three miles out, my right hip flexor started giving me trouble. Every time I lifted it, I felt pain shoot up my right side. I knew I wasn’t injured but at the same time my hip flexor was over lifting. It was just done. I tried to alternate lifting with my left and right legs, which hurt less. We were going so slow it seemed to take forever. Finally, with one mile to go, I looked at Dan and said, “I don’t know how we are going to make enough vertical gain to be able to finish one last mile.” We continued switchback after switchback, while walking with some other people. But the sun was dropping, and we finished most of that last mile in the dark. Reaching the top was kind of uneventful. We tried to take a picture, but it was too dark to see the South Bright Angel Trailhead. But we had done it; we had completed a double crossing. It ultimately took us a little over twenty hours, a little longer than I had expected, but we had some additional challenges—hiking at night, in the snow. I experienced some illness, and we lost a little time getting off-trail. Overall, I am pleased with what we did. The entire adventure was everything that I anticipated and more. It was indeed epic. This crossing is definitely one of the most beautiful things I have ever done. I will consider a Rim to Rim again but as far as a double crossing, I am going to leave that up to you or somebody else. I would like to give special thanks to Dan for slogging this one out with me. I couldn’t have done it without you. I want to thank Woody for all of his input. (He did the same crossing three weeks later). I want to thank Chris for the use of his trekking poles and his advice on the trip. Thanks Coach Kim for your advice. Thanks to John for the inspiration to do it. Thanks to my special woman Andi, who always lets me chase my dreams. I love you honey.